Jack and the Beanstalk Slot - Try for Free or Play for Real Money! NetEnt bring a whole new dimension to the classic “Jack and the Beanstalk” fairy tale with a fun, inviting and perfectly polished slot game based on this beloved tale. Jack and The Beanstalk video slot tells the story of the well-known boy (Jack) and his time with the giant, and in this case, a two-headed, purple giant. And like Jack, you could walk away with riches. The design, look and feel of this slot is nothing less than extraordinary. It’s clear that NetEnt have put an exceptional amount of time into the graphics, animations and details that really adds to the thrill of playing. Are you ready to steal some treasures from the giant? Then, let’s check out what Jack in The Beanstalk has to offer. When you first load up Jack and The Beanstalk, you will be greeted with a cut scene of the giant’s castle in the sky. Sneaky Jack makes a run for it with the giant’s golden egg laying hen, while the giant chases him. You literally feel the adventure and excitement and humor, even before the first spin. 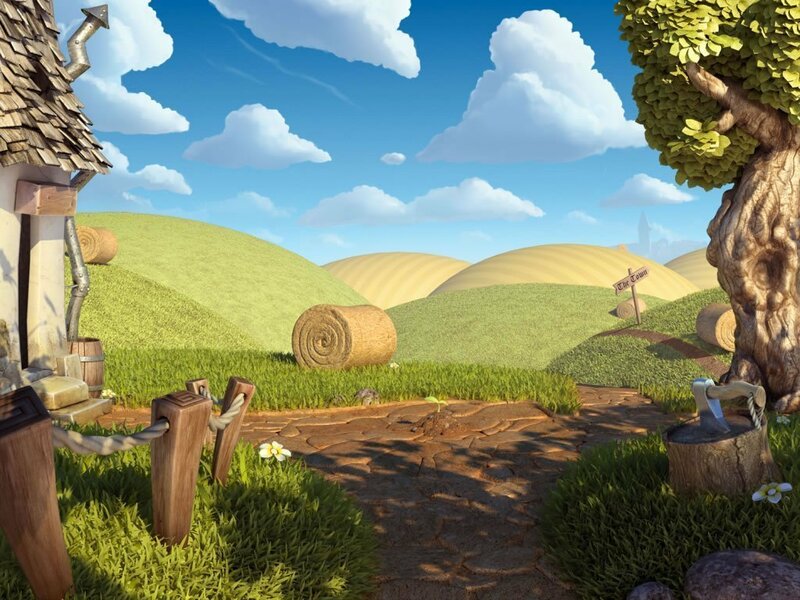 The backdrop of the game is Jack’s house and the Beanstalk, and you can hear the sound of birds as well as the environment playing in the background. A few blue, tiny butterflies sometimes fly by, and birds sometimes land on top of the reels. As with most NetEnt slots in recent years, all paylines are active and your bet amount is adjusted by setting the coin value and level. The level is, in essence, the amount of coins per total stake amount. The first special feature of Jack and The Beanstalk is the ‘Walking Wild’. When a Wild appears on the reels, you are awarded a re-spin. During the re-spin, a Wild symbol moves over one reel to the left and another re-spin takes places. This process continues for as long as there is a Wild symbol anywhere on the reels. All wins with the Wild pay X3. The Walking Wild can appear in both the main game and during Free Spins. Take note, the Wild does not substitute for Scatters or Key Symbols. The next major feature is the ‘Treasure Collection’. This is triggered by getting a key symbol on reel 5 during Free Spins, and this in turn unlocks some interesting Wild Features. 2 Stacked Money Bags – You need to collect 3 key symbols, and when the next Wild appears on the reels, it will become a Stacked Wild of 2 money bag symbols. 3 Stacked Golden Hens – Here you need to collect 6 key symbols, and when the next Wild appears on the reels, it will become a Stacked Wild of 3 golden hen symbols. Expanding Golden Harps – Collect 9 key symbols, and the next Wild that appears becomes an Expanding Wild with a golden harp symbol that expands to cover the entire reel, and changes for a chance of even bigger wins. Note that stacked Wild symbols cover 2 or 3 positions on a reel, whereas the expanding wild expands over the entire reel. The high-value symbols in Jack and The Beanstalk online slots are the main character, Jack, who can pay out 1000x if you land 5 of his face; the two-headed purple giant which gives 750x with 5; watering can and goat both give 250x and the lowest one is the axe which gives 125x for 5. The low-value symbols are A, J, K, Q, plus 10. Wild symbols are a red book with Jack and the Beanstalk written in golden letters. The treasure chest is the scatter symbol and 3 or more of these triggers the free spins round. Jack and The Beanstalk doesn’t have a bonus mini-game, pick an object or spin the wheel type bonus. Probably the closest thing to a bonus feature is the Walking Wild. Jack and The Beanstalk give free spins, and these can be activated by landing three treasure chests on your reels which will give you 10 spins, and if another three come up, you will get five more spins. During the Free Spins, the treasure collection feature described above comes into play where you need to collect the keys to unlock the various options. Jack and The Beanstalk is not a progressive jackpot slot game and doesn’t have a fixed jackpot amount. There are 20 fixed paylines. Jack and The Beanstalk has an RTP 96.3%. 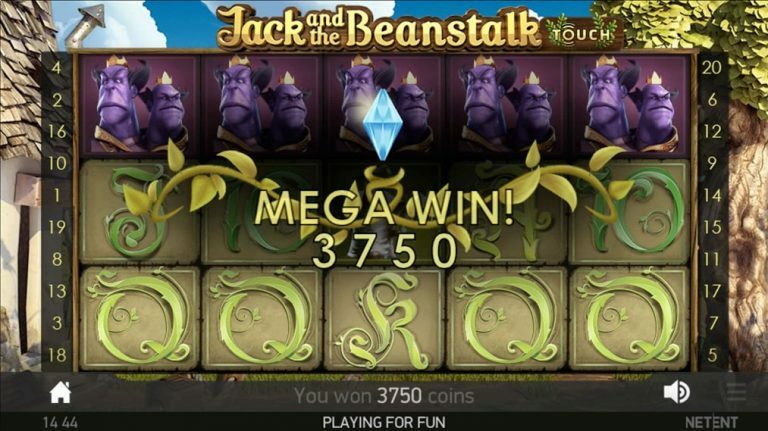 The volatility of Jack and The Beanstalk is medium to high, so you should see some regular wins, and some special features to give you the opportunity for more wins. Jack and The Beanstalk is good fun and exciting to play. The game is beautifully crafted and playing the game is easy. The graphics are outstanding and add to the pleasure of playing the game. Possibly some bonus features or rounds would have added some variety and more action, but overall, Jack and The Beanstalk is definitely worth taking for a spin.